Mineral rights (subsurface rights) generally transfer with the surface unless there is a reservation. What is a reservation? …Grantor does hereby grant, sell and convey unto Grantee all interest in and to that certain property, described as [legal description]. Grantor reserving, however, all oil, gas and other minerals… This clause can be stated a number of different ways and the reservation can be broadened or limited depending on the intent of the Grantor. Point being, not all of Grantor’s right, title and interest transfers. As a mineral rights buyer, now for over 20 years, spotting reservation language is obviously a very significant part of our title due diligence. Just because the most recent 5 title transfer documents do not contain reservation language does not mean there is a mineral interest there to transfer. 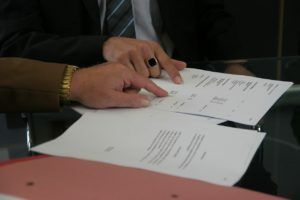 If you are thinking of selling your royalties, need a mineral rights appraisal, or a free consultation regarding title transfer, estates with oil and gas royalties, or other general issues common to mineral rights and royalty owners – call us at 800-950-6954 and for more information, visit our website at https://www.LegacyRoyalties.com.